Sometimes you just gotta have pancakes. Well, I do anyways. I’m sure I’ve mentioned before that breakfast is my favorite meal of the day…no matter what time I eat it! I don’t make pancakes all that often, usually only for a special occasion breakfast (think…birthday or holiday) but tonight I just felt like having a comforting meal. Shannon at Nourishing Days has created the absolute best recipe for Fluffy Coconut Flour Pancakes I’ve ever tried…I’ve made this recipe dozens of times using both coconut milk and heavy cream and they always turn out great! Below I’ve posted the recipe I use regularly, which is her original recipe halved with a touch of cinnamon added. If you do have leftovers they freeze well. My favorite topping for pancakes or waffles will always be maple syrup, bananas and walnuts, I rarely stray from that combo but you could top your pancakes with anything you like…or they are even great with just a dollop of butter or drizzle of coconut butter! Preheat griddle over medium-low heat. In a small bowl beat eggs until frothy, about two minutes. Mix in milk, vanilla, and sweetener. In a medium-sized bowl combine coconut flour, baking soda, cinnamon and sea salt and whisk together. Stir wet mixture into dry until coconut flour is incorporated. Grease pan with butter or coconut oil. Ladle a few tablespoons of batter into pan for each pancake. Spread out slightly with the back of a spoon. The pancakes should be 2-3 inches in diameter and fairly thick. Cook for a few minutes on each side, until the tops dry out slightly and the bottoms start to brown. Flip and cook an additional 2-3 minutes. Serve hot with butter, coconut oil, honey, syrup, or fruit. Breakfast is definitely my favorite meal of the day, in fact I could eat breakfast food for all my meals, I love it that much. I was recently watching The Best Thing I Ever Ate… on the Food Network, the Breakfast Food episode where Aaron Sanchez was eating these little fried puffed pancakes dunked in warm maple syrup…I had to have them! I started doing some research on what exactly they were and how I could make them healthier, of course. I searched for puffed or stuffed pancakes and the only thing that popped up was Aebleskivers, which are traditional Danish pancakes in the shape of a sphere…in America that simply means a puffed pancake. I couldn’t wait to try to make them and knowing this also meant I was going to get a new pan as well! I had seen the stuffed pancake pans in Williams Sonoma but for some reason they were never that appealing to me, that is until I saw those babies on TV, who knows…I may have just been hungry that day! 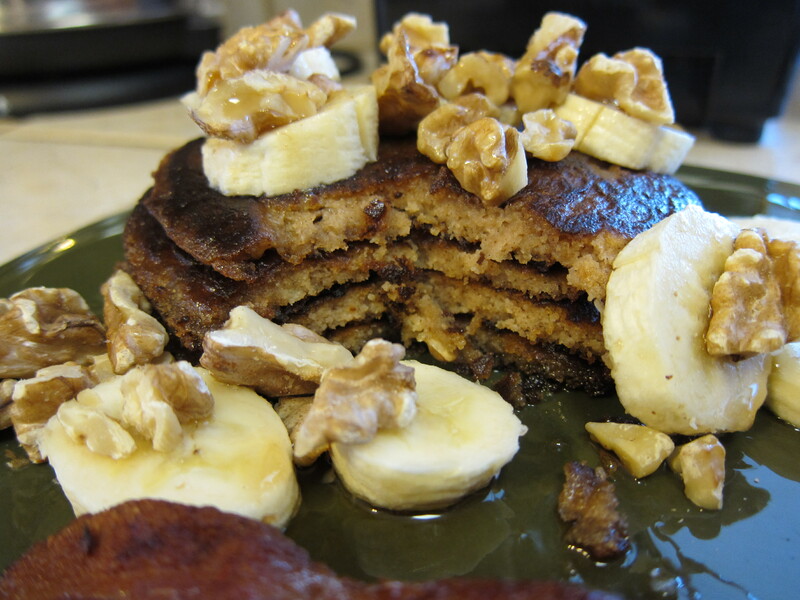 At any rate, I have experimented a bit with several gluten-free pancake recipes and a few different fillings, the possibilities are endless with this breakfast food. If you are not gluten-free a simple buttermilk pancake mix works beautifully along with any filling. Gluten free mixes are a bit more challenging as you will need to make sure the batter is pretty light and airy otherwise the Aebelskiver will not cook all the way through and will be slightly doughy in the middle, ick. Now, since I am grain-free as well, I wanted to try to make the Aebleskivers with a coconut flour pancake recipe…to be perfectly honest I didn’t expect them to turn out, especially on the first try. Surprise, surprise, this was actually my most successful attempt…they were perfect, light and airy, done in the middle and YUMMY! I used the Coconut Flour Pancake recipe from Cooking with Coconut Flour by Bruce Fife and stuffed them with chopped apples that I heated on the stove with some apple juice and cinnamon until they were soft. 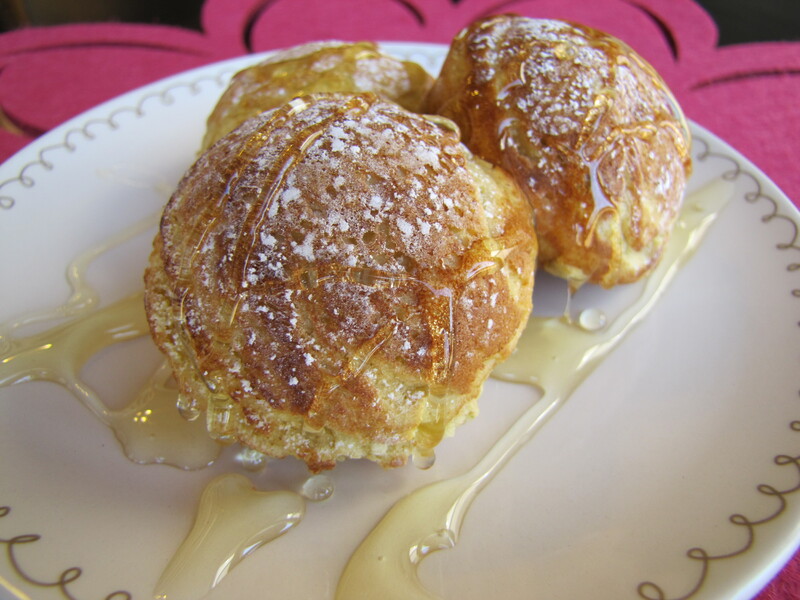 The picture here shows them topped with a honey drizzle, they are also great dunked in maple syrup. I eat mine with some additional cinnamon apples on top and a dollop of fresh whipped cream rather than syrup or honey…although they are great plain or hot off the pan with some butter too. Serve these with a side of homemade Maple Sausage and your good to go!!! Blend together eggs, oil, coconut milk, sweetener and salt. Combine coconut flour and baking powder and thoroughly mix into batter. Let batter set for about 5 minutes, it will be thick. Heat Aebleskiver pan over medium heat, brush each cup with melted butter or coconut oil. Spoon 1/2 T. of batter into each cup, place filling into the center of the mixture, top with and additional 1/2 T. of batter. Use a spoon or chopsticks to turn the pancake over when the bottom starts to brown and cook until golden on both sides. Remove from pan and serve warm. Makes 7-9 Aebleskivers. ***Please note there is not much sugar/sweetener in this recipe, if you desire a sweeter pancake you may add up to 2 T. of palm sugar, agave, maple syrup or honey. A few last thoughts…to date I have not perfected the Aebleskiver with a gluten-free pancake recipe, the ones I’ve tried so far all tend to be too doughy, next I will be trying my Quinoa Pancake recipe so stay tuned on updates. Also, there are so many variations for an Aebleskiver, sweet, savory, breakfast, appetizer…the options are limitless so I think the investment in the pan is well worth it. Enjoy!